No, it’s not a party throwing cats around! That is sooo un PC and worthy of an SPCA callout! 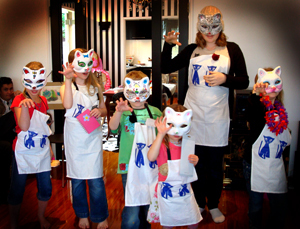 It was a recent party to celebrate the 2nd convening of the Cat Club Inc. 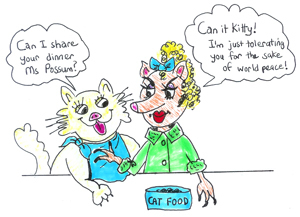 Yes, Ms Possum’s good friend Natalia, then aged 6, formed the Cat Club about a year ago and is the self appointed President thereof. This exclusive Club is only open to members who possess a bona fide possum fur “Possycat” made by Possum New Zealand and Natalia’s serious professionalism to this marketing cause resulted in each one of us having to sign our names into a Formal Registration Book as a pre-requisite. Thus far, Cat Club members are aged between 4 and 14 years old; apart from Ms Possum of course, age of whom is a State Secret! We also have our own surreptitious “Hello Kitty Wave” which is a discreet lower horizontal arm movement to greet each other (quite superior to the Freemason handshake I might add). However, Ms Possum may have O.D’d on Hello Kitty when she visited Asia frequently at one stage – it’s a cat that really got her claws stuck in Ms Possum at the time as this scary feline possessed the ability to replicate herself 1000 fold wherever Ms Possum went – it was like a multiplicity horror movie! To this day, she shudders at the mere thought of running into Hello Kitty again! However, Ms Possum felt very privileged to be the only grown up allowed in the inner sanctum of the Cat Club as even parents were persona non grata. The first part of the events schedule was dedicated to business and a consideration of the minutes of the last meeting. Then, by Natalia’s decree, Ms Possum was appointed Vice President. Ms Possum felt very honored to be second-in-charge but the very mature, now 7 year old, Natalia insisted that if anything happened to her so that she could not attend a subsequent meeting, that Ms Possum knew enough to be able to cover. Ms Possum graciously accepted this onerous responsibility but politely said any meeting would definitely be postponed until Natalia could attend. All present clapped in unanimous approval. 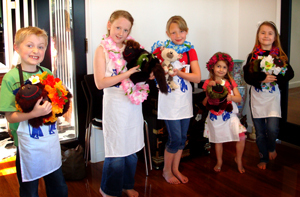 The next point of business was to introduce a guest of honour: Jade , aged 8 years old, who was visiting Auckland – and while she did not have a Possycat, she did bring another toy cat which made her eligible to be a part of the festivities. More spontaneous applause to welcome Jade. So, with business over, we had a jam packed itinerary. First of all, we donned “cat aprons” and our official possum fur “cat badges”. As Natalia had proposed a Hawaiian dress code, the cat club members and cats were very brightly coloured for the “Catwalk” Fashion Show. New York Fashion Week wasn’t a patch on this! The audience was comprised of the proud parents who, not surprisingly, gave good reviews, so it’s just a matter of time for Vogue to realise this burgeoning talent. Second on the agenda was the “Cat Mask Painting Competition” – yes folks the $2 (plus) Shop had these amazing Cat Head masks in reconstituted cardboard that just needed felt tip and highlighters added and the results were stupendous!! There was complete silence when this activity was being carried out as all were in rapt concentration to win the “Best Mask” prize. The audience voted with a show of hands the winners, but as there was suspected nepotism surrounding this process, prizes were handed out to all entrants to counteract any blatant vote rigging. Then it was on to the “Cat IQ” test, with Ms Possum asking very simple to very hard questions about cats so that all could participate. An example of an easy question for the younger members was: “What rhymes with cat?” and for the adults: “What ancient civilisation had cats for Gods?” Anyway, we all learnt something and more prizes were awarded. Email Ms Possum for the full set of questions if you dare to determine in which “cat”egory of intelligence you belong. Dinner for all was next, but the highlight was the cutting of the Cat Cake for dessert. Tracey, one of the Mums, made this yummy cat cake with sweets as whiskers and ice cream cones smothered with chocolate for the ears. 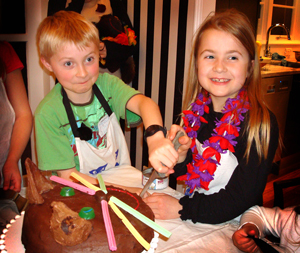 We think Natalia and Hunter cutting the cake may be a precursor of things to come in 20 years! Watch this space. 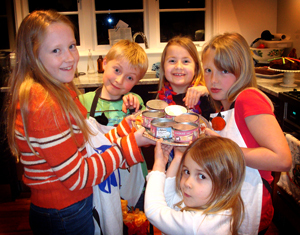 And no cat party would be complete without tinned “cat food”! Natalia googled some cat pics and stuck them to the sides of the recycled tins and placed chocolate treats inside. Delish!! All in all, a fab evening and Ms Possum was at her “cattiest” best. Yes, she does convene with cats as Ms Possum is not “racist” when it comes to other animals as she feels world peace might be achieved more quickly if we allow for diversity and preclude hegemony between animal groups. She tries very hard not to be too political about these things but she probably is a closet social reformer of sorts. Let Ms Possum know if you want to start a Cat Club and she will even let you pick your fave colours to go into the making of your own individualised Possycat. Ask your parents first before you max out their credit card for a gaggle, herd or litter of possycats!! All Ms Possum asks is that you put them no where near that Hello Kitty as Ms Possum will not be held responsible for any cat fight that might ensue. This entry was posted on March 13, 2011 at 7:24 pm and is filed under New Products, Possum, Possum Fur, Possum Stories. You can follow any responses to this entry through the RSS 2.0 feed. You can leave a response, or trackback from your own site.